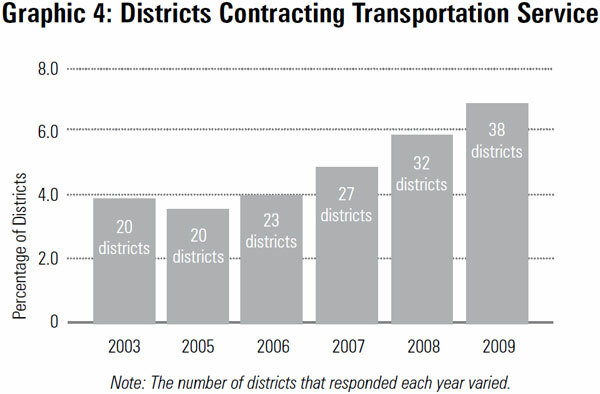 6.9 percent of districts (38 out of 551) contract out for transportation service. Six districts began contracting out the service. Contracting out for transportation services is expected to yield districts $1.7 million in savings. While not as prevalent in Michigan districts as the other two services, transportation contracting has grown substantially. In 2005, only 3.6 percent of districts contracted out the service; today, 6.9 percent do. With six districts new to contracting out this service, transportation privatization grew by 18.5 percent this year, and savings estimates for districts new to transportation contracting range from $21,200 to $965,300. Montabella Community Schools uses a private company to provide its services, but the district decided to purchase its own school buses for the company's drivers to use. Some districts' officials may be concerned about the high cost of purchasing buses if a transportation contractor doesn't work out. Montabella avoided this risk by maintaining ownership of its transportation equipment and leasing it to the contractors. Westwood Community Schools did not offer transportation to students in previous years, but to make the district more attractive, it began offering the service and uses a contractor to provide it. Benton Harbor expects to save $70,000 annually through differences in the costs of employment with its contractor. But those savings were only one factor in its decision to contract out: The district had an aging bus fleet, and with projected deficits, it did not expect to have the funds to make the necessary replacements. Its contractor bought the district's fleet for $400,000, which gave the district an influx of cash, and the contractor bought new buses to serve the district. White Pigeon Community Schools is hiring its transportation director through an employee-leasing service.